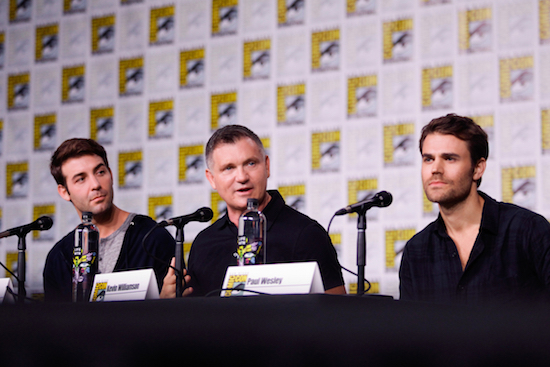 James Wolk, Kevin Williamson, and Paul Wesley during the Tell Me A Story panel at Comic-Con 2018. Photo Cr: Francis Specker/©2018 CBS Television Studios. All Rights Reserved. After more than twenty years working on network television (with shows like DAWSON’S CREEK, THE VAMPIRE DIARIES, and THE FOLLOWING) under his belt, writer Kevin Williamson is making a leap with CBS All Access’ TELL ME A STORY, his first project for a streaming platform. TELL ME A STORY, the new series from Kevin Williamson—the mind behind SCREAM, THE FOLLOWING, and THE VAMPIRE DIARIES—will premiere on Wednesday, October 31, CBS All Access announced. CBS Television Studios has set its Comic-Con plans. In addition to the STAR TREK DISCOVERY panel and exhibit, the studio is bring the CHARMED reboot, the final season of CRAZY EX-GIRLFRIEND, as well as new shows TELL ME A STORY (from executive producer Kevin Williamson) and MAGNUM P.I. Additionally, there will be a TWILIGHT ZONE marathon of classic episodes to celebrate the upcoming CBS All Access series.